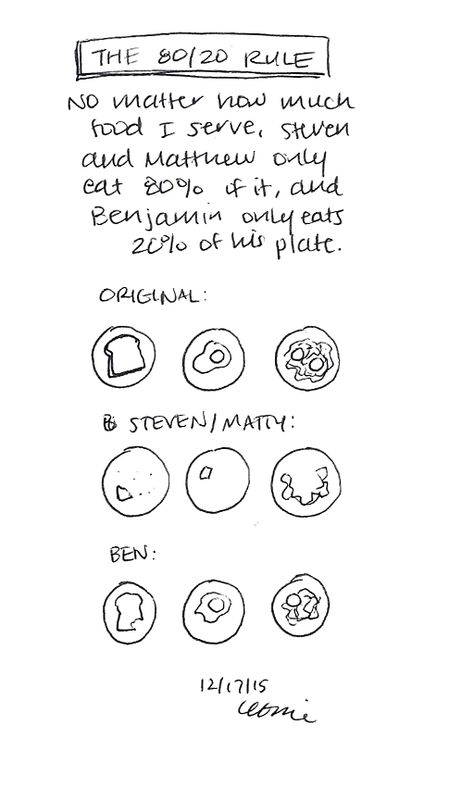 The 80/20 rule, applied to what my children eat. 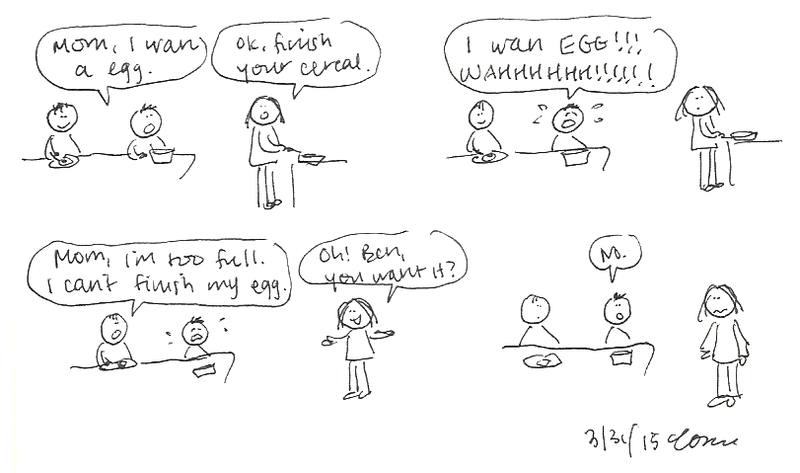 Benjamin was eating his bowl of cereal when Matthew came out and asked for a fried egg for breakfast. Imagine Matthew’s tone of voice when reading this comic: Completely cheerful and optimistic. 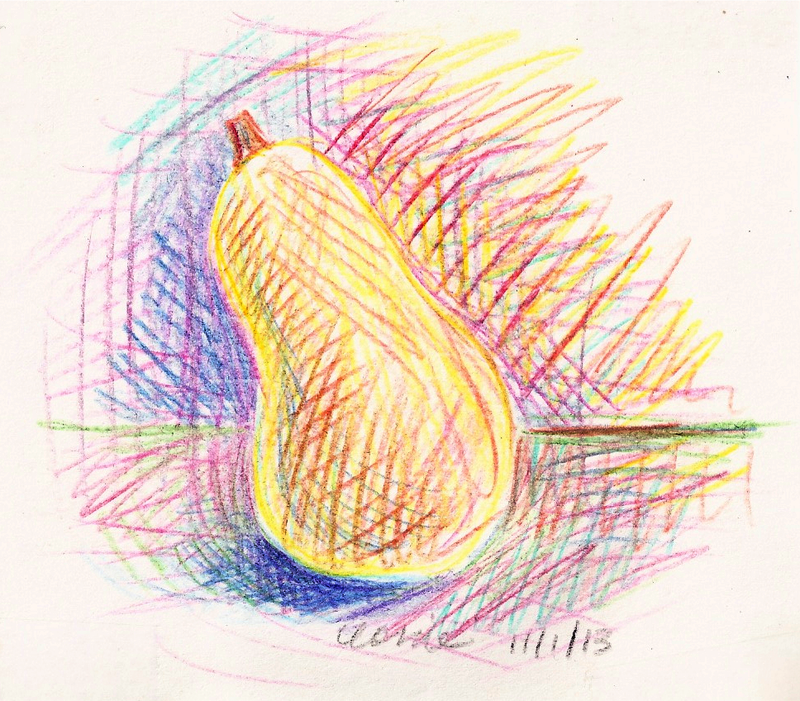 Why do I have a butternut squash picture uploaded in my comics directory? No idea. In June 2006, Steve and I went with my mom, my sister Angela, and her kids to visit my sister Leslie and her family. Our return trip had lots of problems, involving an overbooked flight and a missed connection flight. We ended up being in the airport for a while. So, we went to the Dunkin Donuts stand downstairs. We got in line at Dunkin’ Donuts. There were no labels, but I recognized the Boston Kreme donuts (Steve’s favorite). There were powdered sugar donuts, so I was hoping they would be Bavarian Kreme (my personal favorite). But my mom, behind me, asked, “Are those Lemon donuts?” and the cashier nodded, so it wasn’t looking good. The cashier turned to get the Boston Kreme donut. He pointed again at the Boston Kreme. “Cream,” he emphasized. My mom ordered a lemon donut and they grabbed one of the powdered sugar-covered donuts for her. My ears perked up. Maybe there were other Bavarian Kreme donuts in the “lemon” tray! I left my half-eaten donut for Steve and went back to the counter. “Sure,” I said, thinking that with my luck, I’d probably end up with two lemon or jelly donuts. I decided that either 1) he didn’t understand English very well or 2) he was new to the Dunkin’ Donuts business and wasn’t familiar with the different kinds of donuts! From May 27, 2006: I found a recipe book from the library for making “real” Japanese food: miso soup, teriyaki fish, a tasty scrambled eggs and beef dish, and more. The recipes were delicious and gave me an excuse to use our cute chopstick holders and Japanese bowls and plates, but I found that the tiny, cute amount of food that I made was disproportional to the number of pots and cooking utensils used to make the food!